AMMONNEWS -US President Donald Trump- who is taking part in G20 which convened on Friday at Costa Salguero in the Argentinian capital, Buenos Aires- started his day early on Friday with a cordial meeting at the Casa Rosada with Argentine President Mauricio Macri, a longtime business acquaintance. Posing for photos in the gilded Salon Blanco, Trump said they would discuss trade, military purchases and other issues. The US businessman-turned-politician noted he had worked with Macri’s father on real estate developments and joked that when he and Macri first met they’d never have imagined their future roles on the world stage. 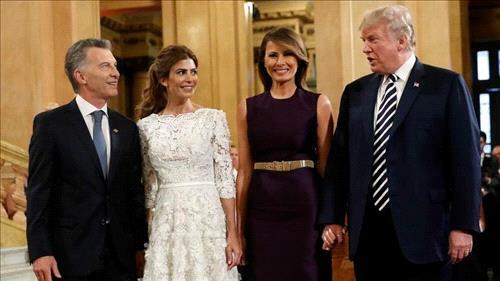 Trump and First Lady Melania Trump concluded the evening with the other leaders at a formal dinner and cultural performance at Teatro Colon.